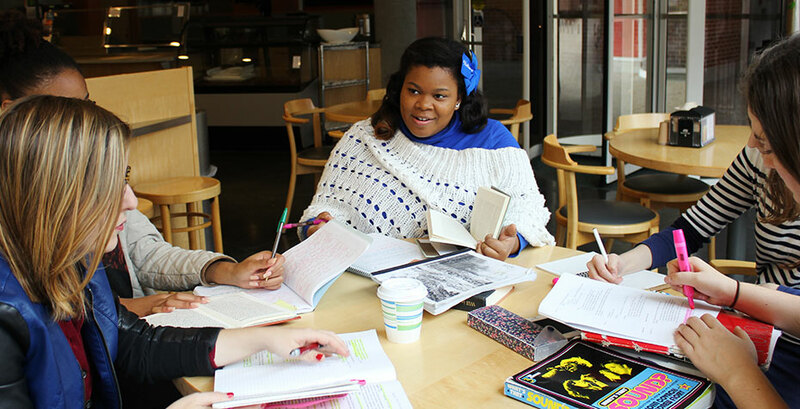 A poster in her high school guidance counselor's office inspired Arlevea Freeman ’15 to check out Wellesley. She toured campus, “ended up falling in love,” and the rest is (almost) history—Freeman will graduate this coming spring. She was recently invited by The Root, a news, opinion, and culture site for African-American influencers that was founded by Harvard professor Dr. Henry Louis Gates Jr., to write about the reasons why she chose to attend—a “predominantly white institution” generally, and Wellesley in particular. We caught up with Freeman, an economics major and religion minor, and member of the Shakespeare Society who also works as an intern in the Center for Work and Service and as Academic Peer Tutor Coordinator, to learn more about her story. Q: In your article, you said that, after you “discovered Wellesley in your senior year it landed among your top choices”—how did you discover Wellesley? Freeman: I discovered Wellesley by seeing a poster in my high school counselor’s office the fall of my senior year. I thought, “Wow, that is a pretty campus! Where is Wellesley?” My counselor had been contacted by admissions and knew about fall open campus. She encouraged me to attend and, of course, pushed the greatness of our alum network. I applied for a “grant” that would fly me to Wellesley for the weekend (and get me out of class for a day) from Chicago. I got the grant and ended up falling in love with the campus, the engaging classes, but most of all the amazing conversations I had with students and prospies, the hard work I saw them putting into their studies, and the dedication to their community and the world that struck me as powerful and unique to Wellesley’s campus. How would you sum up your advice for other students who might be considering Wellesley? I always say go to a school that makes you feel alive and that pushes you to become your best self. I was looking for a new home and an academic paradise full of rigor; I was lucky enough to get both. How did you get connected with The Root for this story? The alum network is powerful! I was asked by a recent alum [Katherine Leung ’14] if I would be interested in writing about this topic. I jokingly tell people that I “bleed Wellesley Blue,” so I enthusiastically expressed my interest. From there I was connected to an alum [Diamond Sharp ’11] who is currently working at The Root and wanted someone to write a story on this topic. What drew you to economics as a major? In high school I took AP Economics and loved how graphs, numbers, and theories neatly explained our world. It aligned with how I understood the world. I could not get enough of it and tried to take two economics classes a day as one of the AP Econ classes was taught during my lunch period. I thought if I could understand economics and use it in the world, then I can use it to improve the lives of people. I am very fortunate in that next year I will be heading to the Federal Reserve Bank of Chicago as an analyst in the statistics department. I will also be studying to earn my CFA (Chartered Financial Analyst). Read Freeman’s article, Out of My Racial Comfort Zone: Why a Predominantly White College Was Best for Me, on The Root.